⟩⟩⟩ 5. 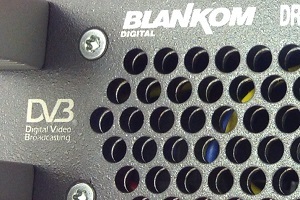 Generation BLANKOM® DVB-C Headend Technology. Satellite and IPTV input, DVB-C (QAM) output, with Multiplexer. The content of the individual DVB-C packages can be freely configured from all available input channels. The device can be operated from anywhere on LAN, WAN or Internet. BLANKOM HDC-6012 is a next generation cable-tv headend system, in one unit. Satellite and IPTV channels can be combined in 4 different DVB-C groups and distributed over coaxial cable to large networks. BLANKOM HDC-6012 is a high performance and cost-effective QAM modulator. It has 12 DVB-S/S2 FTA tuner inputs, 4 groups multiplexing, 4 groups scrambling, 4 groups QAM modulating and supports maximum 128 IPTV inputs through GE port and 4 adjacent carriers (50MHz~960MHz) combined output through the RF output interface. BLANKOM HDC-6012 is also characterized with high integrated level, high performance and low cost. It supports dual power supply (optional). This is very adaptable to new generation CATV headend systems. All in one headend unit for SMATV systems in residential blocks, hotels, offices etc.